Did you land a great scholarship? The truth about these college 'discounts', and what they really are, will surprise and empower you! Did you know some colleges use the FAFSA 'against' you? Get insider tips and learn what to do when you have special financial circumstances. The offers are on the table, but that doesn't mean you have to accept them. Learn how to talk with financial aid offices to ensure maximum aid dollars. Can You Afford Your College Dream? You've excelled in high school, applied to college, the acceptance letters have arrived, and now comes the hard part -- reviewing the financial aid offers and determining what you can afford. College insiders have helped us pull together invaluable information that can help you get the financial aid you deserve. This controversial Ebook is a collaborative effort between college admission officers, who wished to remain anonymous, and the team at College Factual - an innovative site that uses custom tools and outcomes-based data to guide students and their mentors through the college selection process. Your informaion is safe with us. Promise! Enter your email to send the book to. "I have personally used the information contained within this book to help a close family friend successfully negotiate a better financial aid package for her child. No one should overpay for college. Download this controversial book and you'll see why our 'college insiders' wished to remain anonymous." Reduce Your College Tuition Costs! Download our eBook today and enjoy all the other perks of being a College Factual member! 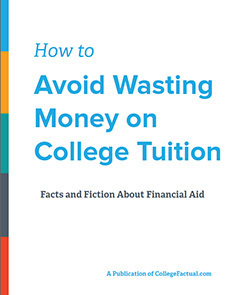 Avoid Wasting Money on College Tuition: Facts and Fiction on Financial Aid.